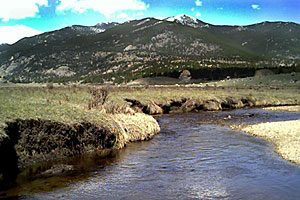 You might not recognize the mighty Colorado at its headwaters in the Kawuneeche Valley. Up here, the river is small enough to jump across in many places, and flows through marshy meadows and beaver ponds before collecting its strength in three major reservoirs: Grand Lake, Shadow Mountain Reservoir and Lake Granby. 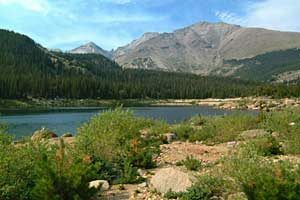 Below these lakes, the Colorado continues to grow as it adds water from such well known streams as the Williams Fork, the Blue, Eagle and Roaring Fork rivers. What starts as a river with a flow of under 100 CFS, collects enough water before entering into Utah to grow to over 21,000 CFS! Brook trout and Colorado River Cutthroat trout dominate this upper section of the Colorado. The stream can be waded throughout the Kawuneeche Valley except during high water, typically in late May through mid-June. This upper portion of the Colorado River inside Rocky Mountain National Park cannot be floated. From November through March, the primary food source is midges, and hatches occur throughout the winter. Sizes range from 14-26, and any olive, red or black midge nymph or Griffith’s Gnat in these sizes may lure these trout out of their winter doldrums. Play them quick and keep them in the water! April and May bring warmer days and the snow and ice melting away. The flows are usually low for the through late May, increasing to flood stage as the snowmelt increases flows in all the feeder streams (Timber Creek, Onahu, East Inlet, North Inlet). Midges continue to be a key food source, but we begin to see baetis hatches, and occasional Stone and Caddis hatches. Surprisingly, although this upper river is a “freestone”, scuds are common and can be found in orange, olive and tan. The source of these scuds is the alpine lakes, high above this valley. There are rumors that brook trout exceeding 5 pounds can be found gorging on scuds in these high alpine lakes, but it takes a fly fishing expedition to reach them. June is usually a month where the river purges its system. The flows push the water to the top of the banks, and flow like chocolate milk for much of the month. Some feeder streams run virtually clear, and where they dump into the Colorado the fish will feed in the seam between the two. October is when the Park starts to put on her blanket of snow, and lie down for winter. The weather can be warm or frigid, often in the same day, but the fish can be voracious. Pulling streamers through deep holes can bring explosive strikes, and terrific runs, but as the month draws to a close we return to midges, baetis and scuds in sizes so small you can’t thread the fly if your hands are cold.